Hosta ‘Tattoo’ is supposedly a very difficult hosta to grow, and many never make it through their first winter. When I bought mine several years ago, it was one of the most pitiful-looking hostas I have ever seen, but I bought it anyway because I had never been able to find one locally before. Despite the slug-eaten leaves and stunted growth, I actually paid more for this Tattoo than I have ever paid for any other hosta, because each of its leaves had a very distinct and dark maple leaf outline. That tiny, sick-looking Tattoo is now one of the most beautiful hostas in my gardens and has grown to form a twenty-four-inch mound, which is larger than the standard. It flowers profusely every year but does not produce seeds. I have not been able to find out if this hosta is sterile. I was sent one of these in a hosta swap last summer. The label said tattoo but the maple leaf outline is only on two of the leaves. I thought perhaps a young plant might not have as strong an outline but the leaves don’t look any better this year than they did when I first got it. I’m hoping the outline gets darker with time? I have one too. Mine has two eyes. It had four eyes last year. I think I must have one of the weaker specimens but I do hope it will survive because I think it is a most unusual Hosta. Everyone who sees it is impressed but mine does not have as good an outline as yours. Very nice photo’s btw. 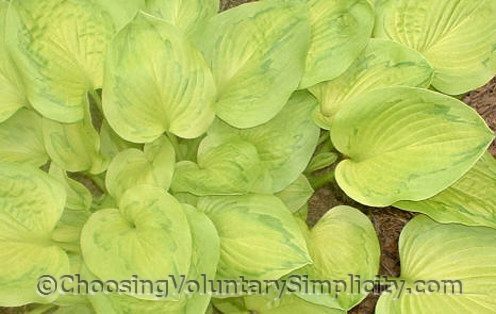 I had never heard of this hosta before but I will be looking for it now. What an interesting leaf it has! 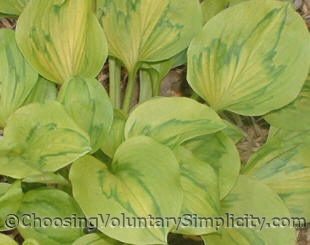 I find your site very helpful in identifying some of my hostas that I didn’t know what they were. 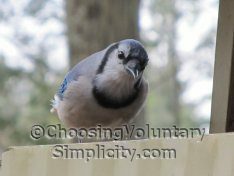 Especially the photos because they are so clear.